Introduce movement and character to an entry or living area with this charming rectangular wall mirror. Showing off a gorgeous finish, this rectangular wall mirror from Uttermost features a black painted finish over copper with rub-through. Delivering exceptional warmth and character, this wall mirror features beveled glass surrounded by a chevron pattern frame. Hang vertically or horizontally with included D-ring brackets. 30" wide x 40" high x 1 1/2" deep. Hang weight is 25.74 lbs. Glass only section is 19" wide x 29" high. Surrounding frame is 5 1/2" wide. 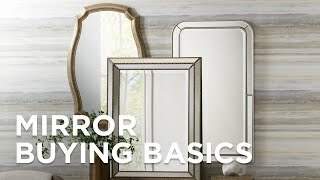 Rectangular wall mirror from the Uttermost Destination Mirror collection. Can be installed vertically or horizontally. D-ring brackets. Painted black over copper finish. Metal frame construction. Beveled glass. The look fits with farmhouse decor without being overbearing with it. Because do black and copper nice frame ties in with black and brown furniture and size was good we will use it horizontally. I have been pleased with all our purchases from Lamos plus both on line and in store! Perfect fit for the guest rest room. Elevate Matte Black 27 1/2" x 31 1/2"
This large frameless rectangular wall mirror with square black metal brackets adds personality to any space. The softbrushed steel frame of this mirror features four subtle rectangular accents for a simpledecorative touch. This dazzling rectangular wall mirror has three clear glass frames that are purposely askewcreating a chic and fascinating modern look.